(a) Turn the crankshaft pulley, and align the timing notch with timing mark 0 of the No. 1 timing belt cover. (b) Check that the valve lifters on the No. 1 (IN and EX) are both loose. If not, turn the crankshaft 1 revolution (360 ) and align the mark as above. (c) Check the valves indicated in the illustration on the left. Using a feeler gauge, measure the clearance between the valve lifter and camshaft. 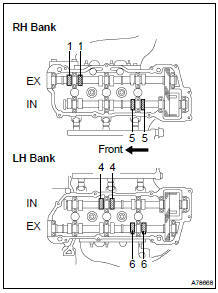 (d) Turn the crankshaft 2/3 of a revolution (240 ), and check the valves indicated in the illustration on the left. Record valve clearance measurements that are out of the specified range. These measurements will be used later to determine the size of the adjustment shim to be installed. 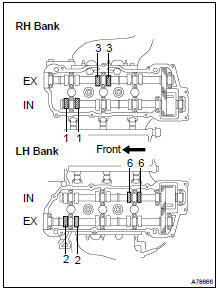 (e) Turn the crankshaft 2/3 of a revolution (240 ), and check the valves indicated in the illustration on the left. (a) Turn the camshaft so that the cam lobe faces upward. (b) Turn the valve lifter with a screwdriver so that the notches are perpendicular to the camshaft. 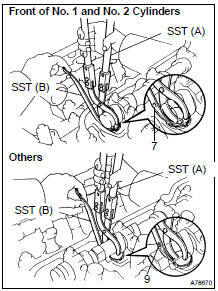 (c) Using SST (A), press down the valve lifter and place SST (B) between the camshaft and valve lifter. Remove SST (A). Apply SST (B) at a slight angle on the side marked with "9" or "7" at the position shown in the illustration. When SST (B) is inserted too deeply, it will get pinched by the shim. To prevent it from being stuck, insert it gently from the intake side at a slight angle. (d) Using a small screwdriver and magnetic finger, remove the adjusting shim. (e) Using a micrometer, measure the thickness of the removed shim. 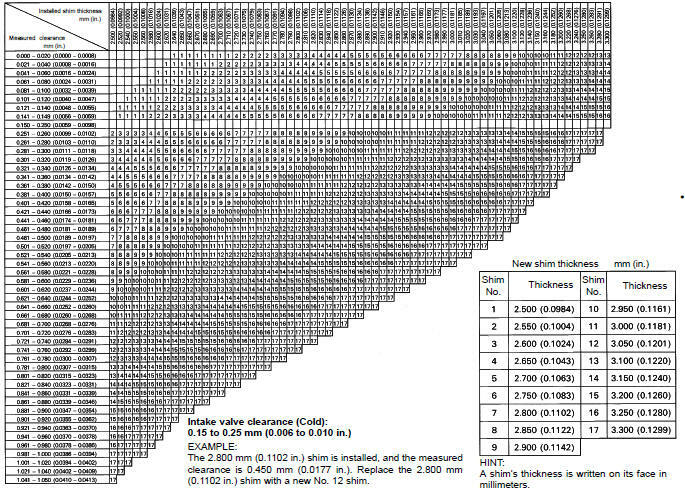 (g) Select a new shim with a thickness as close as possible to the calculated values. Shims are available in 17 sizes in increments of 0.05 mm (0.0020 in. ), from 2.50 mm (0.0984 in.) to 3.30 mm (0.1299 in.). 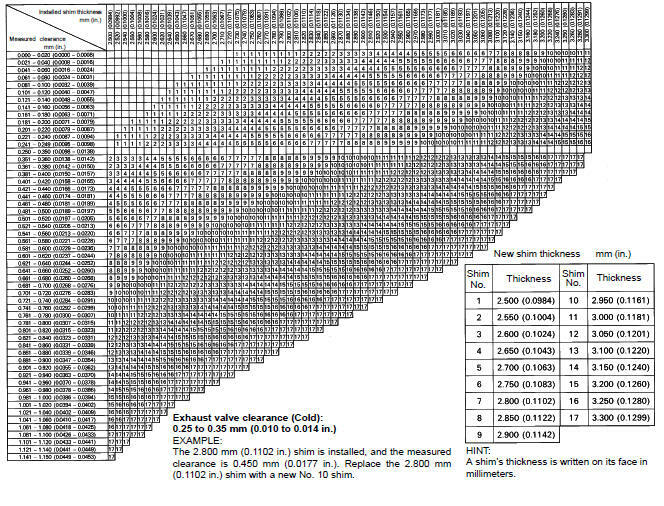 Refer to adjusting shim selection chart on the following 2 pages. (h) Place a new adjusting shim on the valve lifter with the imprinted number facing down. (i) Press down the valve lifter with SST (A), and remove SST (B). 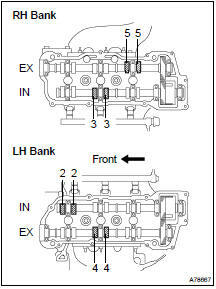 SST 09248-55040 (09248-05410, 09248-05420) (j) Recheck the valve clearance.